I made it past kindergarten. I know that on the calendar, October follows September. Still, I was surprised yesterday morning when I received an email already touting Halloween promotions. This both confused and excited me. It still feels like summer (perhaps due to the oppressive high 90s heat we’ve had all week in SoCal). How could it already be Halloween? I do LOVE Halloween. Seeing this email already has my brain spinning about what I’ll be this year. I need to come up with something to top last year. 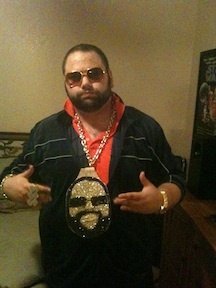 I was Rick Ross, complete with bling of my own face. It did raise the question, when should you start your holiday email promotions? We’re officially a week into September, leaving just under two months until Halloween. Anybody who is smart will start their Halloween prep early. We’ve all been the person stuck with the slim pickings left at the pop up Halloween stores at the last minute. Emails like this one from Pier 1 are a good way to get your customers ready for Halloween early. Halloween is a fun holiday. You should be sending fun Halloween email campaigns to match. Pier 1 executed this with some “punny” copy. The main text in the email reads: “Halloween is creeping up. And we’re crawling with ideas.” Get it? Yeah...I figured you all completed kindergarten too. Hopefully besides setting you into a panic about your Halloween costume, I alerted you to begin planning your Halloween campaigns (I recommend checking out our Halloween email templates). As long as you plan ahead and come up with a creative campaign, your subscribers will be as excited about Halloween as I am. Or you can always bribe them with candy.